The ramblings of a PhD student who's trying to 'get a life'. Yeah, yeah. Cheesy I know but I am watching Episode I whilst I type this, so it seems appropriate. It’s been nearly a month since my last post, not a month since I drafted one but I decided not to publish. Sometimes I can be my own most critical editor. My supervisor switched about three weeks ago to talking about ‘when’ I submit, which I took as a hopeful sign. The final iteration of revisions was relatively minor, he still has concerns about one area, and whilst I’ve tried to address these, I’m actually looking forward to being able to discuss this in the viva. My internal and external examiners have been appointed, and provisional dates have been discussed, but not agreed yet. I’ve printed off two draft copies and we’re independently proof-reading them, one by me and whoever pops over for coffee, the other by some willing volunteers at work, which I’m very grateful for. I have in mind a day when I submit this, best to keep it to myself – until I post to this Blog, and Facebook, and Twitter, and I’ll be seen celebrating in a hostelry. The acknowledgements section at the start was written a while back, and some things have changed within it. It’s dedicated to my Aunt, who died almost a year to the day before I submit. I may well post the page here after my viva, it says a lot more about the support team I’ve had behind me than I’ve shared here. After submission we confirm the viva date. I’d like to think that’s a breather, but it’s not, I’ll be spending time reading the important papers that have had an influence on my work. There are four possible outcomes for the viva, but I’ll write more about that later no doubt. Following a weekend off the PhD, it was time to get back to polishing the draft. My supervisor has agreed a time that I should send my draft to him, and we’ve also set some other deadlines. Today I went through the 177(!) references that I have, and for those that I have a copy of the papers, I’ve moved them to their own folder, naming them something meaningful, The next thing is to source the ones that I’ve not got (in reality I’m sure I’ve got a copy, but I’ve ‘filed’ them under something else or their text is not searchable for some reason). I guess the big news of the week is that I’ve secured an external examiner. I had a ‘wish list’ of what I wanted from the one person who will be completely independent at my viva. A knowledge of the context in which the study took place, and someone who might empathise with what I was trying to do were top of the list. My supervisor offered some advice, and was then pro-active making contact with our agreed first choice. We are now looking for a suitable internal examiner. My thesis straggles both education and business, and we’ve discussed having someone from the Business School from Lancaster as an internal examiner. We’re still discussing options, but I’m still really comforted that we have a good external examiner all set to read my thesis, once complete. Someone else who is close to submitting their PhD is Mark Carrigan, and in this post he writes about a difference sort of procrastination. He also has the cutest GIF ever created to make his point which you have to view. I hope he doesn’t mind if I add it here. Let’s make one thing clear, there’s only one reason I want to keep hold of my green ball, and that’s fear that someone is going to take my green ball and puncture it, be that a supervisor or one of my examiners at my viva. Some of my cohort who are also close to completion are struggling with the final revisions needed, and I’m sure that I will too when I get there. After a week which has left me very frustrated (for the first time ever at work, a little bit sweary), I really didn’t think that I would get much PhD work done. I had five sections I needed to complete, plus a lot of little tidying. But some lunchtimes in the library, and a couple of long evening sessions, plus a period of being mercifully headache free have meant that I’ve managed to complete a first draft. The feeling right at the end was of relief, but also tinged with sadness and a bit of worry. I’m not daft enough to think that this is it, and everyone has told me that this isn’t the end, but it has to be the beginning of the end. I’ve now got a couple of weeks to polish it, I’ve got a mass of proof reading corrections to make already, and there’s a couple of known inconsistencies in my style that I’ve got to address. I’ll then send off to my supervisor, and then head up to see what happens next. I will have lots of work to do, but I’m ready for that and arrangements have been made to ensure that I can give the rework the attention it deserves. But for the time being I can celebrate in a typically British way, with a cup of tea. Tonight I’m out with friends, and I may just have a glass or two of wine to celebrate. I love the Winter Olympics, the diversity of sports and the broad spread of talents on display in each sport. Even though I’ve never put foot to ski, I can really relate to this sport. Bear with me on this one…. you have to overcome obstacles, you’re expected to perform as you go, and there’s always the chance that you can crash out at any time. Oh yes, and my knees sometimes feel as bad as those that are doing this as a career. But there’s also a more subtle metaphor (or allegory) hiding here… as you approach the end of the run, you tend to speed up. When talking about student progress over a three year course, we often talk about ‘exit velocity’, noting that for many students their marks improve towards the end of the course. Of course, they could just be getting better at interpreting what we as examiners, or assessors are looking for, but it could also be that they are getting better at what they are doing! 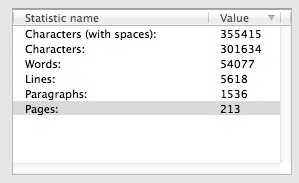 Today, with a good headwind I’ve managed to write 1500 good PhD words. This doesn’t mean they’ll all make it into the final version of my thesis, but they are coherent, make sense, and though maybe lacking in style, do act as a good enough indicator of what I am trying to say. In the four years I’ve been working studying on my PhD, I’ve never written this many words in one day. The end is so close. I have a few large sub-sections to write, some inconsistencies, and I suspect a lot of repetition to identify and either cull or clarify, but I am also only 7,500 words off my word count. A few more sessions like this, and I could be there. The above song is my mom’s favourite, and no reminding her that it’s really a story of a failed romance that’s ignored by the world will shift in her mind that. We’re now in Twixmas, for me the best bit when all the stress of the Big Day is over, and the New Year looms as the chance to have another fresh start. Last year I gave myself four new years resolutions, and I thought I’d see how well I did with regards to them. I am not going to beat myself up if I miss a day’s work due to migraine/sickness/apathy/American Dad DVD boxset. This is a marathon, not a race, and it’s better to write 100 good words that I’m happy with than 200 words that I feel have been squeezed out of me. I will not get shirty when people ask me ‘How’s the PhD?’ rather than ‘How are you?’ – I will thank them for taking an interest and remember that this is a temporary addition to my life. I will not get distracted when working by Twitter, Facebook, Amazon, Tumblr, finding the perfect playlist or podcast to listen to or by discovering that cleaning the dishwasher is a fascinating way of spending an afternoon. I will recognise that whilst I might not yet be the world authority on my subject, I probably know a lot more about it than most people. I’m sure I’ve shared this diagram with you before which is on my noticeboard above me. I’m still pushing at the border… sometime soon the slight bump I can feel will relent. Well I ended up missing a lot more than a day’s work, a suspected subarachnoid hemorrhage will do that to you I guess. The four month break was essential for me to get back on track, yes I missed my first deadline of the end of January 2014 for submission, and it’s touch and go with regards to May 2014 at the moment, most people need some extra writing-up time and whilst I really wanted to submit then, and am still aiming for that, I can’t beat myself up if I don’t hit that, and have to spend a little more time to ensure it’s at the right standard. Distractions continue, and my new 27″ screen doesn’t help here as I can have several things open and available at the same time. I love my new mac, hate that one of the core applications (Mail) doesn’t work how I want it too, or work very well at all to be honest, but I have a nifty workround for that at the moment. I don’t know an easy answer for this, I can’t really say I work better in a distraction-free environment, I’ve spent a lot of time in the university library, you can’t get more disctraction-free than that, and I can’t really say I work better there. But I can record progress on the last one, I do think that I’m ‘pushing the circle’ with regards to my subject. I recognise weaknesses in my argument and have built up some defences about this, about the approach I’ve taken and the reason I’ve written up as I have (despite having a complete mental block in a Skype chat a couple of weeks back about how many chapters I actually had in my thesis (six)). New year, new resolutions…. Well, one, two and three still stand. I think my migraines are under better control now which means I’ve only lost a couple of days since restarting in November to the throbbing headaches that were rather more regular. The only additional one relates to my own expectations about what I can achieve. There’s a paper ‘It’s a PhD, not a Nobel Prize’ that puts the work I’ve been doing in context, as I complete my fourth year on this though, and start nudging into my fifth, the feeling that this should be the last Christmas which will be overshadowed by those three words. Mullins, Gerry and Kiley, Margaret (2002) ‘“It’s a PhD, Not a Nobel Prize”: How Experienced Examiners Assess Research Theses.’, Studies in Higher Education, 27(4), pp. 369–86, [online] Available from: http://libezproxy.open.ac.uk/login?url=http://search.ebscohost.com/login.aspx?direct=true&db=eric&AN=EJ655990&site=eds-live&scope=site. 500 Words isn’t many really. For those that are about to start NaNoWriMo this is a ridiculously low target as they have to aim at a hundred times that number of words. But in a five hour session today it’s what I’ve managed to achieve in my PhD. And I feel pretty pleased with that. Any writer of any kind, be it academic, business, blog or creative writing will know that there are some sentences that just form themselves. From brain to keyboard, there’s almost a magical connection, and no number of tweets, facebook status updates or email/chat/IM messages will distract them. There are other times when you positively crave an interruption of some sort, and if one doesn’t appear, then you will manufacture one. The late, great Douglas Adams was an expert at procrastination when writing, and the fourth Hitchhikers Guide to the Galaxy novel was written in the space of a month in a hotel suite, with his then-editor on the other side of the room allowing him breaks only for the occasional jog around Hyde Park. His book is dedicated to her, and the Paul Simon album ‘One-trick pony’. And so it is with me. To some extent I have a limited number of ‘easy’ bits left to do in my writing up. I need now to really analyse the information that I’ve coded, look at the quotes from my participants that at the time seemed really important and identify how much of their voice comes through in the ‘Findings’ chapter, and whether my whole approach (Luhmann’s Structural Coupling being as you didn’t ask) works, and works for me. I’ve got lots of headings, and sub-headings with lots of blank text underneath. All I have to do (!) is fill in the gaps, add a few charts and diagrams and a generous smattering of references, and I should be sorted. Well, I would love it to be that easy, but a 50,000 word thesis is much more than 5 x 10,000 word documents, something that I tried to comfort myself with early on in this process. I know I’ve taken a four-month gap, but I look at my tracking spreadsheet, that shows what I was doing this time last year, and it really doesn’t seem a year ago since I was working on that particular section. I guess that is a good thing, it means it’s still fresh in my own mind. But it’s my supervisor that’s the ultimate judge (at this moment) on my work, and I’ve sent off a complete ‘thesis to date’ this morning. Let’s hope that the feedback I get next week is both supportive, and critical. And this post, that’s taken less than 20 minutes to produce is now touching 450 words, which probably shows how little I’ve really done the rest of today. Ah well, tomorrow is another day.